What is Continuous Improvement? How does it work? 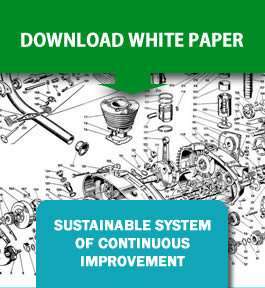 How can you implement Continuous Improvement successfully and sustainably? In this paper Jeff Williams, Head of Food and Drink Sector at S A Partners, answers all these questions and communicates the importance of building business-wide sustainable systems of Continuous Improvement (CI), which goes beyond the traditional focus on operations management and manufacturing. The paper is based upon a presentation Jeff delivered to a sector based, senior management audience at a major food retailer’s annual supply chain conference. He explains what ‘real Lean’ is, how it needs to be implemented, and why it often fails. The paper provides insight into the successful and sustainable implementation of Lean, and the components that drive successful business strategies. To download this paper click the DOWNLOAD WHITE PAPER graphic.